14th Feb 2010, Sunday Evening at Chamber of Commerce. KUWAIT CITY, Feb 15: “Never give up, even after repeated failures, because each failure means a step closer to success,” says a man who had every reason to give up on life. Nick Vujicic was born without limbs and once contemplated suicide during his childhood out of frustration at his seemingly helpless situation, but thought better of it after realizing the guilt, pain and suffering it would bring his parents. He has since learned to deal with those circumstances and is now a sought after motivational speaker across subjects such as disability and hope. Vujicic gave a talk Sunday on the topic “Living a life without limits” at the Kuwait Chamber of Commerce and Industry auditorium. 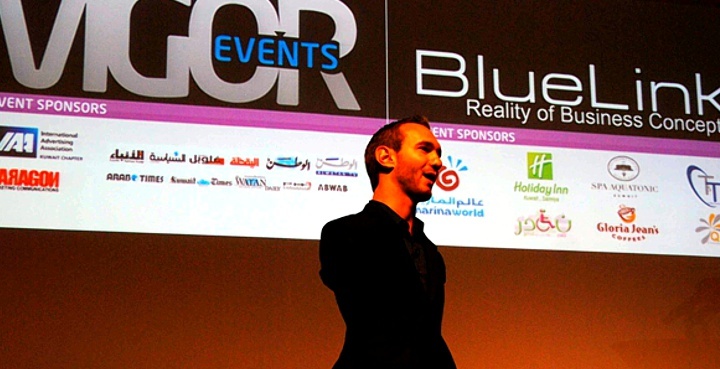 Speaking to a mixed audience of Arabs and non-Arabs from atop two tables joined end to end, Nick Vujicic, without arms and legs but with a fully developed torso and with two small feet one of which has two toes, looked small as he paced about. But when he began to speak those awe inspiring words, people in the room forgot how he looked and he seemed taller than everybody else. “Fear,” he started off, “is the biggest disability of all. You shrink at the thought of failure even without trying,” emphasizing he said “one should not lose hope and keep on trying what one want to make out of their life until they succeed. You don’t know what you can achieve until you try it,” he added. He also said that one should be thankful for what they have. “There’s no use complaining about what you don’t have,” in obvious reference to himself. He challenged his audience and their perspectives, encouraging everyone to dream big and improve their own attitudes regarding the obstacles in their lives. A message driven home by his own persona, his disability a constant reminder that every day challenges they face in their lives can be overcome; that they should use, to the best of their ability the gift they have been given. He also shared key values and attitudes that give one the insight to draw strength from every circumstance by choosing to have the right approach. “If you put your happiness in temporary things, your happiness is temporary;” “Your biggest discouragement comes in your mind;” “It’s no use to hold your love one’s hands if you can’t hold their heart;” and on faith “Just because you can’t see it, doesn’t mean it’s not there;” “You can’t pass hope if you don’t have hope yourself;” and “You can’t pass integrity if you don’t have integrity;” are some words of wisdom he imparted. Born Dec 4, 1982 and the first-born child of devout Serbian Christian parents, in Melbourne, Australia with the rare Tetra-amelia disorder: limbless, missing both arms at shoulder level, and legless but with two small feet, one of which has two toes. His parents were initially devastated upon his birth. He grew up otherwise healthy. His life was filled with difficulties and hardships. One was being prohibited by Australian law from attending mainstream school because of his physical disability, even though he was not mentally impaired. But during his schooling, the laws were changed, and he was one of the first disabled students to be integrated into a mainstream school.